The Chef’s Choice 430 knife sharpener is an easy tool to manually sharpen serrated blades. There is no electricity required, so you can use it in any part of your kitchen, or take it on the go. Unlike other sharpeners, there are no moving parts that need maintenance or lubrication so it is always ready to use. Instead, precision rollers gently guide the knife during sharpening. 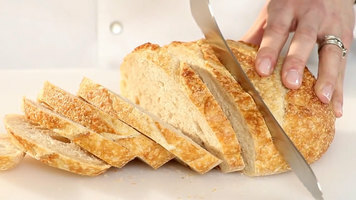 To begin, make sure your serrated knife is clean and dry. Place the 430 sharpener on a flat, stable surface. Put the heel of the knife in the sharpener and move the knife from the heel to the end of the serrated blade and back again. Make sure the blade stays in contact and moves one or both of the red rollers for proper sharpening. You do not need to put any downward pressure while sharpening, however you will hear a light sawing sound as the blade moves to insure it is working correctly. The 100% diamond abrasives control the angle of the blade and create a sharpened edge that is like new. When you first sharpen the knife You will need to make anywhere from 10 to 50 passes, depending on the dullness, size, and type of serration. If you are re-sharpening, you will only need to make 10-20 full passes. About halfway through sharpening, it is a good idea to wipe off the blade and try cutting a tomato. This way, you won’t over-sharpen the knife. Sharpen all of your serrated blades with the Chef’s Choice 430 manual sharpener to ensure safe, precise prep work in your kitchen. 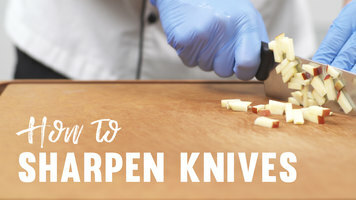 Learn how to quickly and effectively sharpen knives with the Edgecraft Chef's Choice manual knife sharpener! 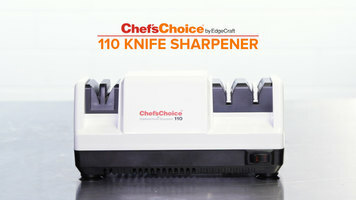 Keep your knives sharp with this Chef's Choice 110 electric knife sharpener! Follow these simple steps to keep the blades in pristine condition.